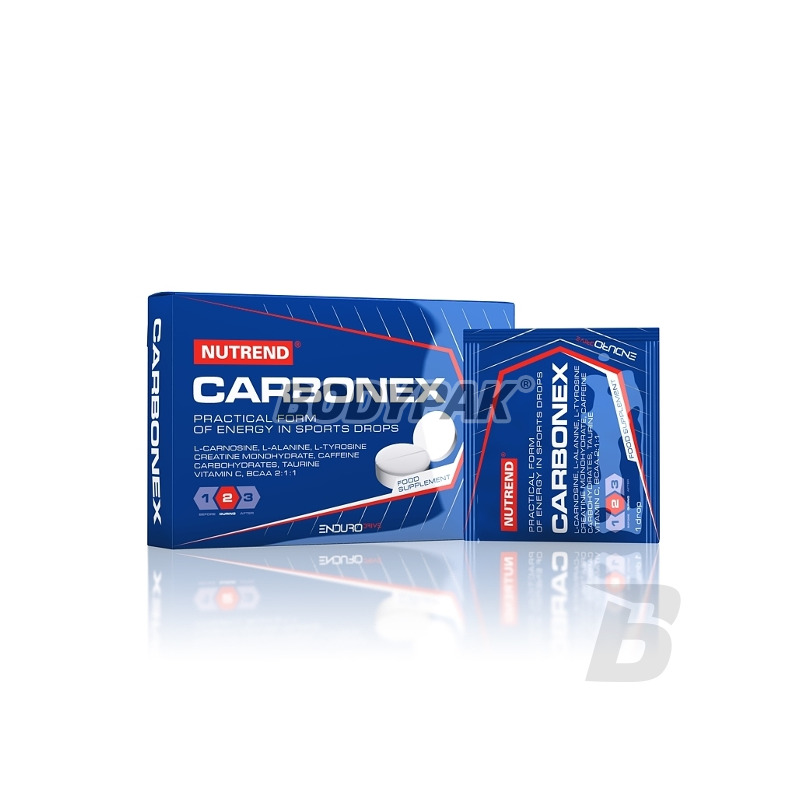 Pre-workoutNutrend Carbonex - 12 tabl. Nutrend Carbonex - 12 tabl. Tasty chewable tablets - the most efficient and rapid source of energy in a practical form. Includes the addition of caffeine, vitamin C, magnesium and BCAA! 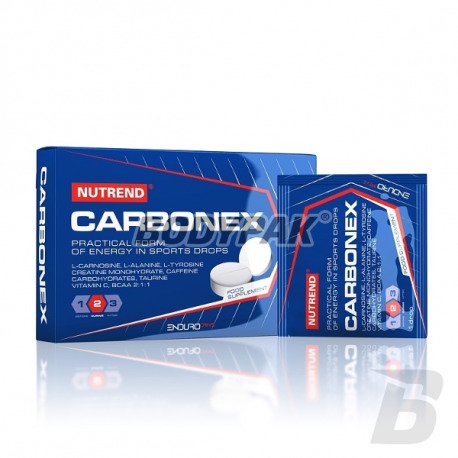 Nutrend Carbonex - tasty chewable tablets - the most efficient and rapid source of energy in a practical form. Dissolution of the tablet in the mouth results in rapid absorption of active substances through the oral mucosa. source of energy are simple carbohydrates: dextrose and fructose and complex: maltodextrin of dextrose equivalent of 10, included in optimal proportions (OPTIMAL CARBOCOMPLEX). Stimulation and energy performance guarantee added active ingredients: caffeine, taurine, l-tyrosine. To increase the energy potential is added creatine. A comprehensive composition enriched with BCAA, vitamin C and magnesium. The addition of caffeine provides an extra boost of energy to work! Składniki: Glukoza, Maltodekstryna, Fruktoza, L-Alanina, Monowodzian Kreatyny, Cytrynian Magnezu, Regulator Kwasowości Kwas Cytrynowy, Substancja Przeciwzbrylająca: sole magnezowe kwasów tłuszczowych, L-Leucyna, L-Tyrozyna, Tauryna, L-Karnozyna, Kwas Askorbowy (Witamina C), Stabilizator Poliwinylopirolidon, L-Izoleucyna, L-Walina, Aromat, Substancja Przeciwzbrylająca: dwutlenek krzemu, Kofeina, Substancje Słodzące Sukraloza I Acesulfam K.